If Sidious (created word?) is the opposite of insidious, then the choice of the moniker by these British newcomers is a bit strange. After all, we expect metal, and especially with the black overtones, to be associated with treacherous and sinister. Sidious members do wear facepaint, but they mix a lot more in their music than just black metal. In a four song quick EP, they have managed to mingle a number of extreme metal styles in one insidious package. 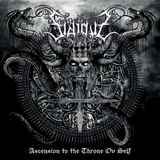 Insurmountable Mass and the closer title track Ascension to the Throne ov Self come the closest to melodic black metal. Insurmountable Mass is a good opener, symphonic, ominous and eerie, but with a slight industrial touch and well blended keyboards. The sorrowful bridge and melodic mid-section is very much early Dimmu Borgir. Ascension to the Throne ov Self also puts the keys towards the front, but the atmospheric break, followed by pounding and the familiar invocation of apocalypses theme reminded me of Behemoth. Whether it is a desire not to be called a copycat, or indeed, a myriad of thoughts swirl in the collective Sidious head, but Sentient Race and Nihilistic Regeneration have little to do with Dimmu or Behemoth. Sentient Race is fast technical death, with riffs turning on a dime, spraying percussive shrapnel in the likes of explosive Cryptopsy, symphonic blended in at the last moment, if not totally forgotten. Nihilistic Regeneration also has some superfast double bass drumming moments, synth slightly higher in the mix, the impression complete of the beastly prowl. I could live with the style mix on Ascension to the Throne ov Self just fine, but whatever the style, the piece that totally did not work for me with Sidious is vocals. I don’t think you can imagine such monotonous faceless deathcore oppressive voice, but it is here. Most unfortunately that this style of singing does not fit almost any of the songs, except perhaps moments on Sentient Race, and that depreciates the first impression from the well-crafted and multifaceted extreme metal foray.